Order a Cardinal truck scale between May 1st 2017 and June 30th 2017 and receive a 10-year weighbridge warranty! Celebrate the strength of Cardinal’s truck scale bridges and join us in the TruckScaleFest going on now. Standard 5-year warranty still applies to electronics. 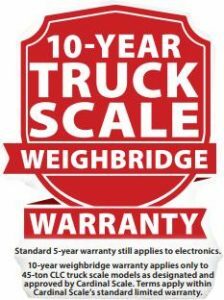 10-year weighbridge warranty applies only to 45-ton CLC truck scale models as designated and approved by Cardinal Scale. Terms apply within Cardinal Scale’s standard limited warranty. One popular choice to consider for this promotion is the 13570-EPR which is a 70 foot long and 11 foot wide steel deck Armor truck scale. As the name implies, Cardinal’s ARMOR® truck scales (EPR Series) provide you with superior-strength, long-life steel construction for optimum vehicle weighing. The ARMOR’s durable baked-on, anti-corrosion tan powder paint stands the test of time. The NTEP legal-for-trade Armor® arrives fully-prepared for installation and includes DB75000-lb stainless steel load cells standard, which are factory assembled. A wide selection of Armor® capacities, platform sizes, and types are available. Each Armor® scale bridge features interconnecting load blocks and receivers for an efficient, no-bolt installation. Rodent protection is standard throughout the scale via conduit integral throughout each scale module. 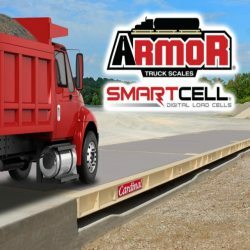 Every Armor® truck scale is 100% assembled and tested before shipping. The PRC series is also available. The Cardinal PRC series is a low-profile, fully electronic truck scale. The high-capacity PRC’s rigid design prevents excessive movement, ensuring long lasting reliability and accuracy in high-traffic installations. The anti-corrosion powder coat painted weighbridge with welded structural steel tube and checkered deck plate is ready to install upon delivery. Features rock-solid steel deck plate to carry heavy loads! Many lengths and capacities to choose from. NTEP legal-for-trade certified. Don’t miss out on this special! The offer is only good until the end of June. Contact us today and we can put together a customized quote just for you. We’ve mentioned SOLAS before but here is just a friendly reminder. 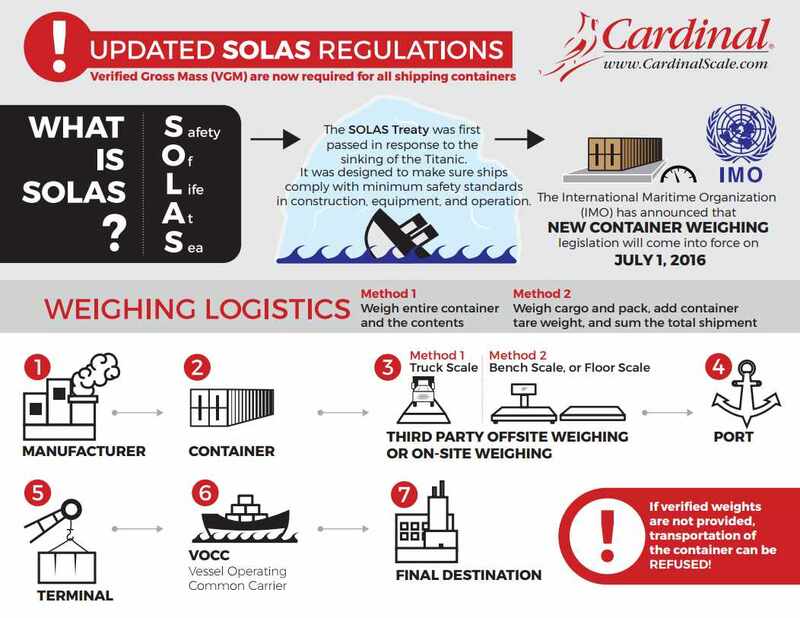 Beginning July 1, 2016 changes to the Safety of Life at Sea (SOLAS) treaty will require verified weight certificates for all containers before they are loaded onto a ship. If the certificate is not submitted in a timely matter (12-24 hours prior to stowing cargo), the cargo runs the risk of being refused passage. This new regulation will have a significant impact on several groups, including scale dealers located near ports or working in the overseas logistics industry. The SOLAS treaty was first passed in 1914 in response to the sinking of the RMS Titanic to improve safety procedures at sea. The International Convention for the Safety of Life at Sea (SOLAS) is part of the International Maritime Organization (IMO), the maritime arm of the United Nations. Aren’t weights currently pre-determined and declared for shipping containers? Pursuant to previous regulations, shippers have already been required to declare container weights on their supplied bill of lading/paperwork. Verification of shipping weights by approved methods of weighing will now be mandatory due to several maritime disasters. These incidents range from falling containers at port or overboard from ships, forklift accidents, on-deck stack collapses (often due to heavier loads stacked on top of lighter loads), and even shipwrecks due to declared weights being as much as 6.7 times the declared weight. The MSC Napoli met it’s end in January of 2007 when 20% of the loaded containers exceeded their declared weight by 3 tonnes; the largest difference being 20 tonnes and the total weight of the 137 containers was 312 tonnes heavier than the cargo manifest. Who will be affected by this new law? 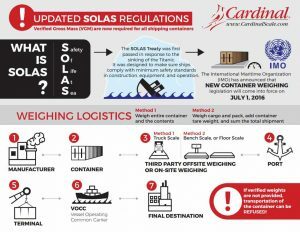 The SOLAS treaty affects 99% of the merchant ships around the world in terms of gross tonnage. These revisions will affect shippers, freight forwarders, and vessel and terminal operators. All of these businesses will need to establish policies and procedures to ensure the implementation of these new regulations. Who enforces the new guidelines? The maritime organization of each country will be generally responsible for enforcement, beginning July 1, 2016. Implementation of the new regulations should begin prior to July 1st to avoid disruptions and fines, as trans-shipments may depart after the deadline. If weight discrepancies are found between the lading paperwork and the actual weight, non-compliant cargo will not be loaded on vessels, subject to the new regulations. Who is responsible for weight verification? The bill of lading paperwork will list the shipper. This entity will ultimately be legally responsible for providing the verified gross mass (VGM). If the exporter uses a third-party agent to pack and weigh the goods to be forwarded to the terminal, the forwarder is acting purely on the instructions of the shipper. Therefore, the exporter remains the legal party responsible for verifying the gross mass prior to stowing cargo. Method 1: Weigh (or have a third party weigh) the packed CTU. Method 2: Weigh all cargo items and packing and securing materials, and add this to the CTU’s tare weight. All methods of weighing must pass standards of accuracy, and should be calibrated according to the appropriate state’s standards. The shipping documents specifying the gross mass must be not only declared, but verified through approved methods. A shipping document ensuring the VGM must be signed by a person authorized by the shipper and submitted to the master/representative and the terminal representative sufficiently in advance, between 12-24 hours prior to stowage, to be used in the ship’s stowage plan. If the shipping document is not provided for the container with a verified gross mass and/or the master or his representative and the terminal representative have not obtained the verified gross mass of the container, it shall not be loaded on the ship. 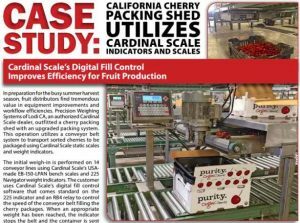 What considerations are there when determining the best weight verification methodology? So, what choices do you have when it comes to obtaining digital weight scales? Cardinal Scale Manufacturing has a wide variety of Made in America load cell kits which allow you transform almost any vessel or platform into an integrated weighing system. A few simple things need to be considered when choosing the right system. We’ll also discuss the proper installation and setup methods to use. Whether utilizing beam, tension, or compression cells in either analog or hydraulic configurations, Cardinal load cell kits give you flexible options to help solve many weighing applications. To determine the total capacity of the system, you first need to know the total weight of the structure that the load cell stands will be supporting (dead load). Add the anticipated maximum system live load to the actual dead load, and that total will be the necessary minimum system capacity. Normally, you want to divide this total by the number of load cells and then go up to the next largest size available load cell. For example, let’s say a tank has an empty weight of 22,000 lb and an anticipated live load of 100,000 lb for a total combined load of 122,000 lb. Using four load cell stands, each cell will be seeing 30,500 pounds of anticipated weight. We would normally use a 50,000 pound load cell in this application. Since many times these systems are under a continual long-term load it is not uncommon for load cells to be almost twice the necessary capacity in order to help reduce signal creep. Installation of load cell kits begin by determining if the floor (in the case of stand assemblies) or the building structure (for tension systems) is strong enough to bear the anticipated load. If not, piers or footings may be needed or additional support structures added. For all overhead suspension type systems, safety chains must be provided locally to bear any anticipated load due to component failure. After the system is assembled, it is necessary to make sure that all of the load cells are taking equal dead load to the extent that it is possible. After the millivolt readings are as close as possible, secure the load cell stand assembles. Grouting the stands in place is the preferred method for long-term accuracy. Most Cardinal Scale load cell stand kits come with checking designed into the stand itself. Depending on the device, some applications may require additional checking. Mixers and blenders are examples of devices that may need additional checking. Also, very tall tanks or hoppers may require additional restraints due to wind load on the structure. Many systems using load cell kits require the connection of electrical supply or control wiring, as well as pipes and supply augers. Discharge chutes or pipes are used to get material out of the tank or hopper. 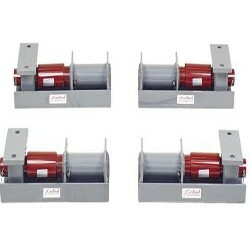 It is very important to understand that anything connected to the scale structure must be installed with flexible couplings so that no path is present for force to be shunted off to ground during the weighing process. The more items that are connected to the structure the harder it is to get accurate weights. Can I Buy An American Made Digital Weight Indicator? Quite often a customer will contact us looking to buy a scale. Often they will have a list of features that they’re looking for, most of which we are able to accommodate. It could be that they need a large size floor scale or maybe they need a scale to be extremely accurate. Or maybe they need a scale that can connect to their computer system via USB or ethernet cable. There may be others but that is the list we were able to come up with. And it includes some very nice indicators like the Cardinal 190 readout which has a display that changes colors. This can be great for check weighing to see if certain items are too light or too heavy. The Pennsylvania 7600E is a really nice indicator for truck scale customers who are looking for a nice indicator that has many great features but doesn’t cost a fortune. 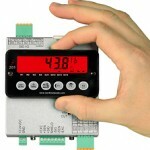 The Cambridge CSW-10 is an entry level basic indicator that is great for simple weighing applications. So there you have it. If you are serious about finding made in the U.S.A. scale equipment we can provide that for you. It may be a little tough to find sometimes and it may cost a little more than the chinese imported products but in most cases we can get you a MADE IN THE USA weighing product.